The Mizar language aims to capture mathematical vernacular by providing a rich language for mathematics. From the perspective of a user, the richness of the language is welcome because it makes writing texts more “natural”. But for the developer, the richness leads to syntactic complexity, such as dealing with overloading. Recently the Mizar team has been making a fresh approach to the problem of parsing the Mizar language. One aim is to make the language accessible to users and other developers. In this paper we describe these new parsing efforts and some applications thereof, such as large-scale text refactorings, pretty-printing, HTTP parsing services, and normalizations of Mizar texts. Supported by the ESF research project Dialogical Foundations of Semantics within the ESF Eurocores program LogICCC (funded by the Portuguese Science Foundation, FCT LogICCC/0001/2007). 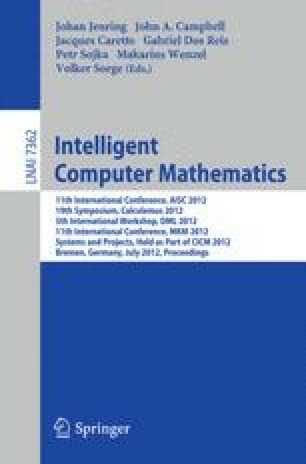 Research for this paper was partially done while a visiting fellow at the Isaac Newton Institute for the Mathematical Sciences in the program ‘Semantics & Syntax’. Karol Pąk deserves thanks for his patient assistance in developing customized Mizar text rewriting tools.